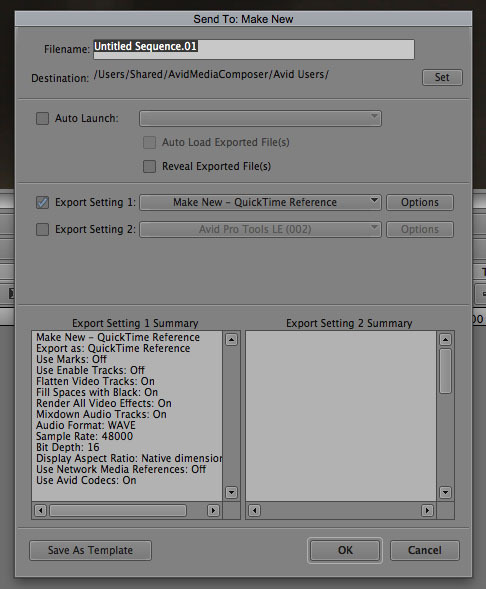 This guide explores the export capabilities of Avid Media Composer. It is written for the beginner, so you can understand what is possible with Avid Media Composer and what isn’t. I highly recommend you read the Avid Media Composer Manual (In your computer: Help > Documentation (PDF)… > Media_Composer_Editing_Guide.pdf) for a more detailed overview once you’re done with this guide. It goes into greater detail, and that’s where you should head if you find something confusing. Export an AAF for third-party software. Send sequence to Avid-based software for further processing. In this part we’ll look at the first option. Make sure your media is online. Duplicate your sequence into another bin as backup. Render effects, titles and filters beforehand. Mix down audio if possible. Going to your Project panel and selecting the Settings tab. Right-click Export (if you want to change a few settings in an available preset choose that) and choose Duplicate. The ‘Send to’ method is supposedly used when your sequence is intended to go into a third-party application for processing. 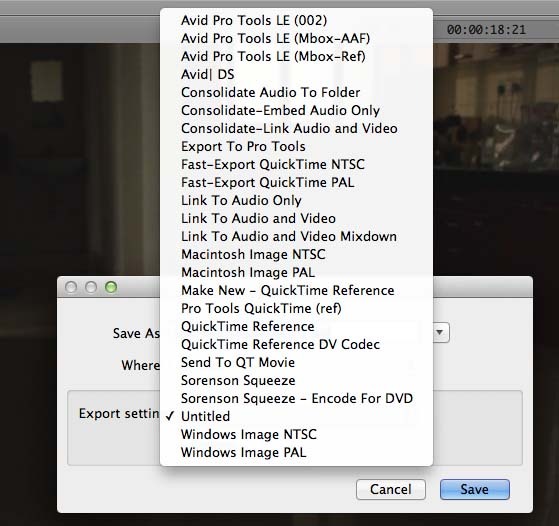 E.g., by default, you have the option to go to Sorenson Squeeze, Pro Tools and Avid DS. On the other hand, the ‘Export’ method is intended to create files and be done with it. You can stick to the method you find most comfortable. 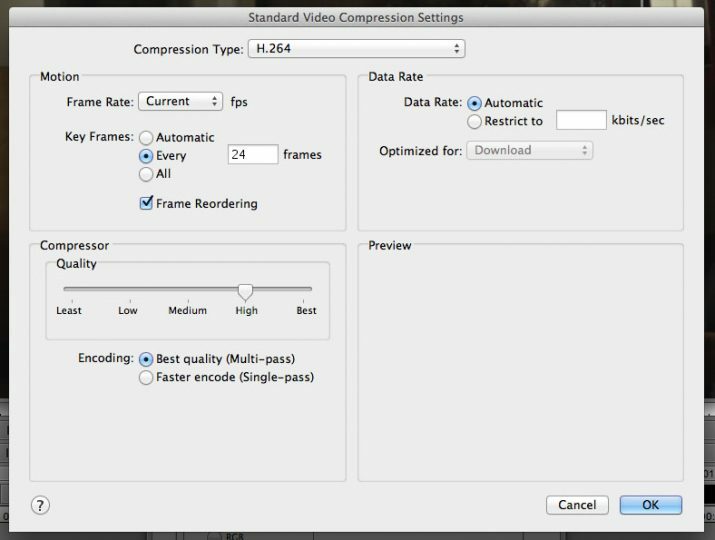 In any case, once you select an export format, you will get further options to edit that codec or file format. One of the frustrating things in Avid Media Composer is digging into an output file format for customization. For a newcomer, finding the right buttons to click (they all look the same!) is hit-and-miss, to put it generously. Four pop-ups later you have access to the codec. Some codecs allow you to even deeper with settings! Anyway, click Ok. When you’re done, click Save. As you’ll see, your exact codec and settings aren’t shown in the Export 1 summary. Click on Save as… in the ‘Export Settings’ box. Don’t forget to select an appropriate filename. The setting will be available in the ‘Export’ option, and also under Settings in the Project panel. Now you know why Avid prefers you store presets prior to exporting anything. Who wants to do this every time? For a detailed overview on each option, refer to page 1390 of the manual. DPX and OpenEXR are not supported. 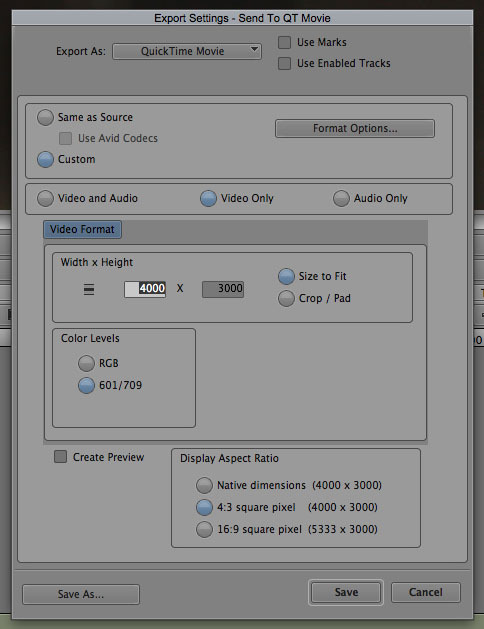 *Choose ‘Graphic’ from amongst the options available and check the ‘Sequential Files’ box to create an image sequence. **Choose ‘Audio’ from amongst the options available. 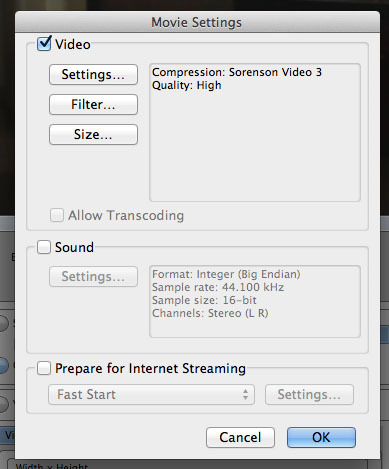 If you want to export to a codec not available, you can choose to buy the Sorenson Squeeze Pro application. For more info, read page 1383 of the manual. In Part Two we’ll look at how Avid Media Composer creates projects that can be imported into third-party software for further processing or finishing. Every time we export a movie from Avid (PC) and bring it into After Effects (Mac) we get graphics with jagged edges. Is there an export format that would fix this issue? Both comps are for broadcast quality HD 1920×1080 frame rate 29.97 – AppleProRes422, the After Effects comp have field render set to off and that’s the way we need it to be, since we’ll be sharing this movie on a digital platform as well.